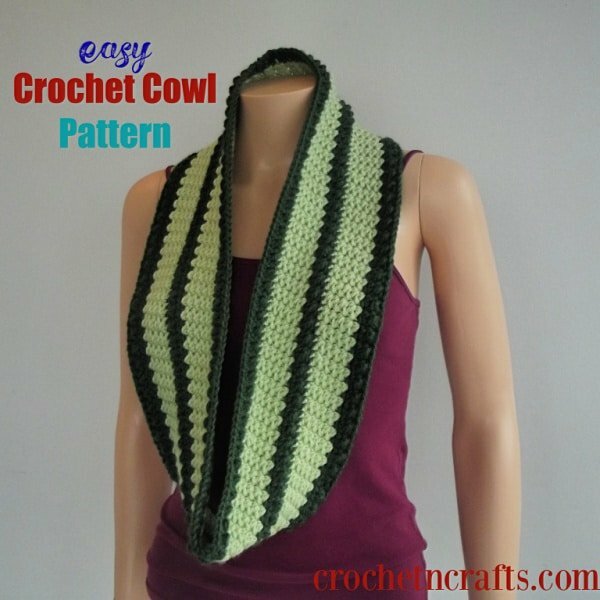 Make this easy crochet cowl pattern in any size you want from child to adult. The cowl is crocheted in two colors for a nice contrast along the textured rounds, but feel free to use one or as many colors as you like. It’s a very easy and mindless pattern, but as you can see, it is elegant enough to wear with any of your favorite outfits. And you can wear it long like a scarf or cozy around the neck as you like. With the snowy winter weather here, it’s perfect for a jacket, but in the spring and fall weather, you could wear it over a long-sleeved shirt on cooler days. The way it is shown below goes great under a winter coat. For this cowl crochet pattern I used Patons Canadiana yarn. It is a soft medium worsted acrylic yarn, but can easily be substituted with anything you might have in your yarn closet. Personally I would recommend Vanna’s Choice or Caron Simply Soft if you don’t have Patons. 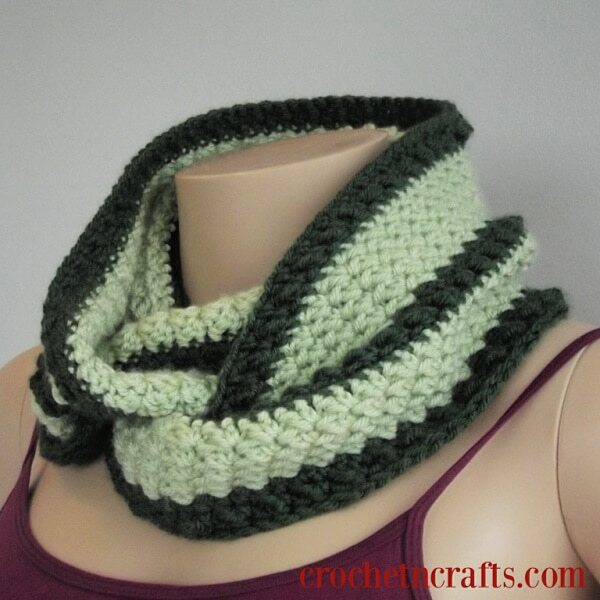 You might also enjoy this quick and easy infinity cowl, the chunky cowl, or this hooded cowl. Although slightly different, this ear warmer for beginners makes for a good match to go with this cowl. The circumference of this cowl can be adjusted in any multiple of two. The height is easily adjusted by doing more or less repeats of the pattern rounds. You could easily increase for a nice hooded cowl if you wanted to. Finished Size: 46″ by 5.25″. With CA, Ch 160 (or any multiple of 2 for desired circumference), join with sl st to first ch being careful not to twist. Rnd 10: Rep Rnd 2 with CA. Rnd 11: Rep Rnd 3 with CA. Rnds 12-16: Rep Rnd 4. Rnd 17: Rep Rnd 9. Rnd 18: Rep Rnd 2 with CA. Rnd 19: Rep Rnd 3 with CA. Fasten Off. You might also enjoy a browse through the crochet cowls archives.